Montsant, Catalunya (Catalonia Cataluña), SpainThe Masroig or “red farm” co-op was established in Montsant, the Holy Mountain region surrounding Priorat, in 1918. This samso (carignan) grown over clay and black slate is a delight to drink. It has all the floral, dried herbs and berries you could want in a red wine with moderate tannins, previewing a medium long finish. This is a wine drinker’s wine that can pump up any weeknight dinner or step in and punch above its weight on the weekend. A workhorse red for barbecue meats.Tasted: 07 January 2019Tasted by: Anthony GismondiTreve Ring Prices: BC	19.99	BCLS Producer: Cellar MasroigDistributors: Waldorf Wine Group Inc.
Montsant, Catalunya (Catalonia Cataluña), SpainCrushed stones, earth, black cherries, blueberries, downy violets, anise imbue this stylish Monstant, the insider's affordable pick that horseshoe-hugs pricey Priorat. This is entirely samso (carignan), and from vines 20-40 years old, fermented cool in stainless for a short stint, to preserve the primary fruit and clicking acidity. Tannins are lightly grippy / tuggy, cushioning the medium+ bodied fruit to a salted, warming finish. 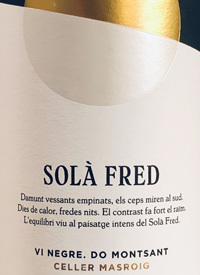 From one of Spain's top co-ops, this softly detailed wine is ready for drinking now.Tasted: 28 February 2019Tasted by: Anthony GismondiTreve Ring Prices: BC	19.99	BCLS Producer: Cellar MasroigDistributors: Waldorf Wine Group Inc.